The Classic Maya site of Xultun is located on high ground west of the Ixcan River, forty kilometres northeast of the site of Tikal in Guatemala’s Petén province. The site consists of a series of buildings, plazas, and several ball courts. The largest structure at Xultun is Structure B-7: each side of its nearly-square base measures about forty-five metres and it rises twenty-four metres to a platform which supports a small structure (von Euw and Graham 1984). Epigraphic study of an emblem glyph associated with the site indicates that during the Classic Maya period Xultun was called B’aax Witz or Quartz Hill/Mountain (Prager et. al 2010: 74). The site was discovered in 1915 by a chiclero named Aurelino Aguayo who notified archaeologists and in 1920 the Carnegie Institute mounted the first of three visits it would make to the site (von Euw and Graham 1984). 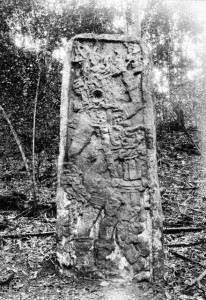 Xultun was explored for three days by archaeologists Sylvanus Morley and Carl Cuthe who discovered and recorded Stelae 1 through 17 (von Euw and Graham 1984). They also named the site ‘Xultun’ or ‘end stone’, in reference to a late date recorded in the text on Stela 10 (a stela that has since been looted, see below). Less than a year later, Morley and his team spent another week at Xultun. During this visit they recorded Stelae 18 through 22 (only three further stelae have been located at Xultun) and took photographs (von Euw and Graham 1984). The Carnegie Institute visited Xultun for the last time in 1923 and archaeologists did not work at the site again until Eric von Euw mapped the area in 1974 and 1975 (von Euw and Graham 1984). 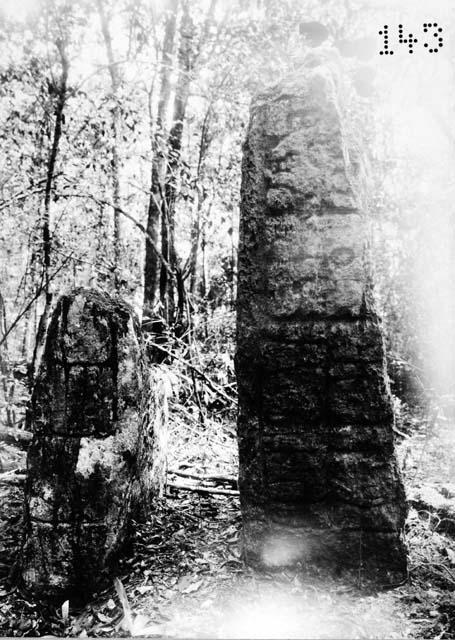 In the early seventies, Stelae 3 and 12 were looted; in late 1974 Stela 10 disappeared. At the time of my first visit to the site, large trenches had been dug into Structures A-S [sic], A-7, A-9 and many smaller buildings. (The looters were active in the site when we arrived, but left four days later when it became apparent that we planned an extended stay). A year later Structures A-I, A-2, A-3, A-5 (again) and many others had been tunnelled through… Xultun has been savagely looted: more than 50 trenches have been made, representing the illicit activity of a number of men for many weeks in the removal of many tons of stone (von Euw and Graham 1984). Stela 3: This stela was found and recorded by the Carnegie Institute team in 1920 and photographed during their second expedition to the Xultun. Its front half was lying face down and its back half was standing in situ in front of a building. The carved front had been looted by 1974 (von Euw speculates 1971). The current location of this stela is unknown. Stela 4: This stela was not looted in the 1970s, however in late 1974 Structure A-3 was looted and most of this sculpture was buried under stones extracted during the looters’ tunnelling. 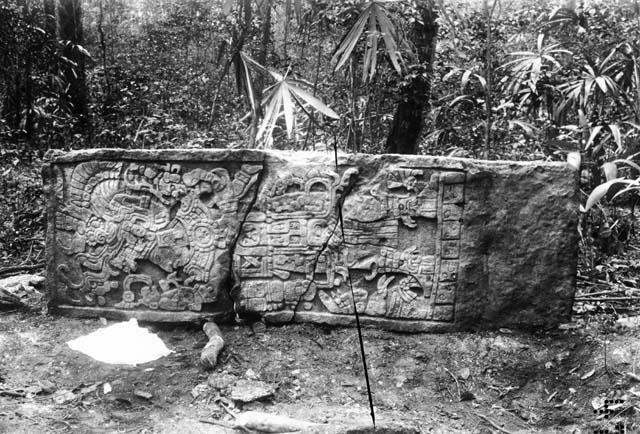 Stela 10: This stela was recorded by the Carnegie Institute team in 1920 and photographed during their second expedition to the Xultun. Sylvanus Morely was inspired to name the site Xultun, based on a date on this stela (Zender and Skidmore 2012: 2). It was seen lying face down at the site in 1974 but by February 1975 it had been looted. The current location of this stela is unknown (Zender and Skidmore 2012: 3). 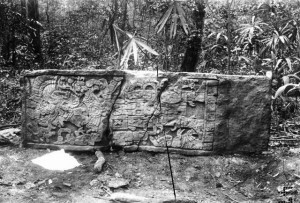 Stela 12: This stela was found and recorded in situ by the Carnegie Institute team in 1920 and photographed during their second expedition to the Xultun. By 1974 it had been stolen, reportedly having been sawn to reduce its thickness about three years before. The current location of this stela is unknown. These allegedly looted pieces include a series of polychrome ceramic vessels that bear the emblem glyph of Xultun and/or the names of individuals associated with the site. A flat dish thought to be from Xultun is in the November Collection of Maya pottery now in the possession of the Museum of Fine Arts, Boston (accession number 1988: 1264; Prager et. al 2010: 75). The piece is listed as having been ‘[c]ollected between 1974 and 1981’ and its ‘place of manufacture’ is recorded as the ‘Xultún area’ (Museum of Fine Arts, Boston n.d.). Another example of an unprovenienced vessel thought to be from Xultun is K8007 in Justin Kerr’s Maya Vase Database (Kerr 2000). The cylindrical vessel is decorated with anthropomorphic fireflies and bears the emblem glyph of Xultun. It was confiscated from a local looter and is now in the Morley Museum at Tikal, Guatemala (Kerr 200). In 2008 an archaeological team led by William Saturno of Boston University began systematic excavations at Xultun (Saturno et al. 2012: 714). In 2010 a heavily eroded mural painting exposed by a looters’ trench was discovered on the west wall of Structure 10K-2 (Saturno et al. 2012: 715). The looting had exposed the murals to rain and a looters’ tunnel had destroyed a portion of the mural. However, numerous inscriptions concerning astronomical cycles as well as figural depictions have been preserved. Kerr, Justin (2000), ‘Kerr Number: 8007’, The Maya Vase Database, http://research.mayavase.com/kerrmaya_hires.php?vase=8007, accessed 15 October 2012. Museum of Fine Arts, Boston (n.d.), ‘Eastern Petén-style dish (1988.1264)’, Website of the Museum of Fine Arts, Boston, http://www.mfa.org/collections/object/eastern-pet-n-style-dish-6024, accessed 15 October 2012. Paredes Maury, Sofia (1999), ‘Surviving in the Rainforest: The Realities of Looting in the Rural Villages of El Petén, Guatemala’, FAMSI Reports[online], http://www.famsi.org/reports/95096/95096ParedesMaury01.pdf, accessed 15 October 2012. Prager, Christian, Elisabeth Wagner, Sebastian Matteo, and Guido Krempel (2010), ‘A Reading for the Xultun Emblem Title as B’aax (Tuun) Witz ‘Ajaw“Lord of the B’aax-(Stone) Hill”’, Mexicon 32 (4): 74-77. Saturno, William A., et al. (2012), ‘Ancient Maya Astronomical Tables from Xultun, Guatemala’, Science 336 (6082) 714-717. Von Euw, Eric and Ian Graham (1984), ‘Xultun’, The Corpus of Maya Hieroglyphic Inscriptions Vol 5.1 and Vol 5.2., (Cambridge, Peabody Museum of Archaeology and Anthropology). http://www.peabody.harvard.edu/CMHI/site.php?site=Xultun, accessed 16 August 2012. Zender, Mark and Joel Skidmore (2012). ‘Unearthing the Heavens: Classic Maya Murals and Astronomical Tables at Xultun, Guatemala’, Mesoweb Reports [online], http://www.mesoweb.com/reports/Xultun.pdf, accessed 15 October 2012. A person who searches the deep jungle for the gum of the chicle tree. Because of their tendency to penetrate the more remote corners of the Petén, chicleros are usually credited with finding many major Maya sites. At times, they are credited with looting them as well (e.g. Paredes Maury 1999). Von Euw and Graham do not cite the source of this information.